As a speech language pathologist (SLP) who “plays” throughout the day, I’ve amassed a cornucopia of toys and games to foster the development of various speech, language, and social communication skills. One game I recently discovered thanks to Patch Products, a toy company and creator of the magical Okay to Wake Alarm Clock, is Yeti in My Spaghetti Board Game . What is Yeti in My Spaghetti? Yeti in My Spaghetti Board Game is a fun game where you carefully remove one noodle at a time hoping the Yeti does not fall into the bowl of spaghetti. A simple, fun game for kids! 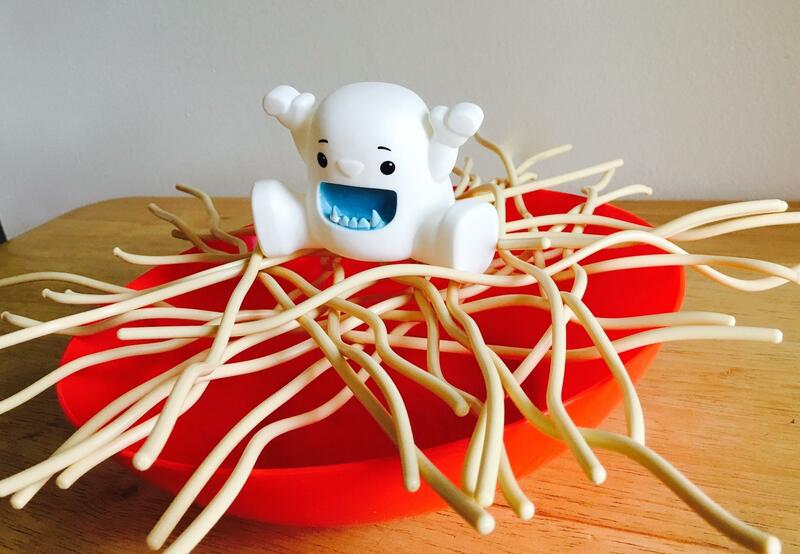 Take turns pulling noodles out one-by-one, but don’t let Yeti fall! This post contains Amazon affiliate links. Thank you for your support! How Can I Use it in Speech Therapy? Since it’s a simple game I primarily use it with my articulation and fluency (stuttering) clients. However, I’ve also played it with my 3 year olds who are new to playing board games as well as those who struggle with turn taking. Yeti in My Spaghetti is perfect for targeting the cluster /sp/ (as in spaghetti) and /j/ sound (as in Yeti) since these sounds occur naturally when playing this game. Drills get boring. At Scanlon Speech Therapy, practice is meaningful, fun, and functional. This drives quicker carryover to spontaneous speech. I’ve also noticed a few phrases expectedly occur when playing this game, such as: “Be careful”, “Don’t let the Yeti fall”, and “The Yeti almost fell in the bowl!”). Thus, if you are working on other sounds (e.g. /f/, /b/, /k/, etc) you can create situations for the targeted sounds to occur or model desired responses containing the targeted sounds when playing this game. 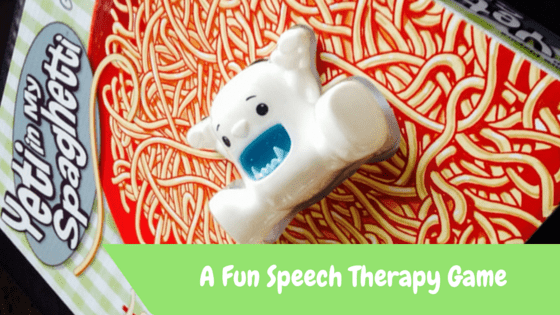 I’ve also been playing Yeti in My Spaghetti as a way for my young clients to practice their fluency enhancing strategies and or stuttering modification techniques. Additionally, I use it when I administer the Lidcombe Program, a behavioral treatment for young children who stutter. Since the game is easy to play and doesn’t require verbal responses, I don’t worry about it creating a heavy cognitive load for my clients. Yeti in My Spaghetti is a fun, safe game for children to practice their techniques without devoting cognitive resources to process or create language. 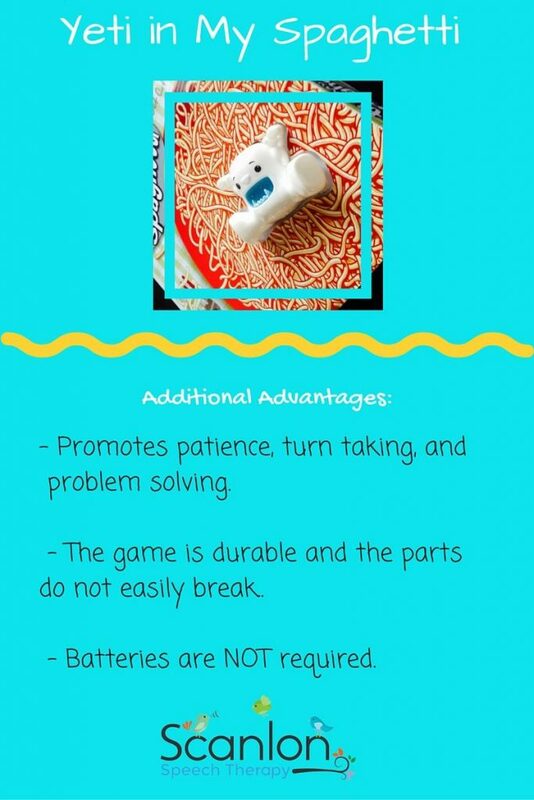 Promotes patience and turn taking, problem solving (e.g. “I shouldn’t move this noddle because…”), cause and effect (e.g. “If I move this noddle, the Yeti will probably fall into the spaghetti”) and fine motor control. The game is durable and the parts do not easily break. Although you could lose a noodle or two. So, if you’re in need of a new, enjoyable, easy to play game, I highly recommend Yeti in My Spaghetti! Kimberly Scanlon, M.A. CCC-SLP is a speech language pathologist, an author and a mother. As the owner of Scanlon Speech Therapy, LLC, a unique boutique practice in Bergen County, Kimberly embraces individuality and treats the whole person. Her goal is to spread compassion, hope, and some speech, language and literacy tips one moment, one person at a time. Her first book,My Toddler Talks: Strategies and Activities to Promote Your Child’s Language Development and her second book,Learning to Read is a Ball are available for purchase online at Amazon and Barnes and Noble.